They must be putting something in the water over there in Brazil [well there is rather a lot of it considering the River Amazon, Reviews Ed] because over the last twelve months or so we have seen an explosion of rock and metal acts from that part of the world; and what has been the most surprising thing for me, is the sheer quality of music that each band has had on their subsequent album releases. Shadowside, Vandroya, Pastore, Soulspell to name but a few, have all put out wonderful albums and joining them with their brand new CD ‘The Sniper’ are Porto Alegre-based Scelerata, a band that has been around in some form or another for the last ten years or so and this is their third release. Their first two CDs featured mixes by Charlie Bauerfeind and Dennis Ward, plus guest appearances from Edu Falachi, Andre Matos and Thiago Bianchi and these guests return on the new album, with the likes of Andi Deris, Charlie Bauerfeind and Paul Di’Anno all helping out. What I find so good about this album, isn’t the inclusion of all the guests or the stellar production or the wonderful songs that feature on ‘The Sniper’. No what really takes my breath away each time I play this album is the twin lead guitar attack of Magnus Wichmann and Renato Osorio, which is just simply mesmerizing. The two men play as if their lives depended on it and on solo after blistering solo they attack your senses with amazingly complex, but extremely melodic guitar passages. Now all this guitar mayhem wouldn’t be of any consequence if the songs weren’t strong enough to support all the histrionics that are going on. 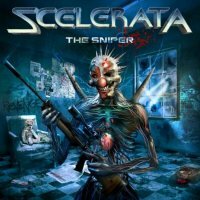 So I’m glad to report that, tracks like ’Rising Sun’, ‘In My Blood’, ‘Road To Death’, the wonderfully melodic Dokken-esque ‘Breaking The Chains’ (where Scelerata vocalist Fabio Juan really shows what great chops he has), the Maiden-esque ‘Drowned In Madness’ and finally the storming title track ‘The Sniper’ are all performed to the highest metaltastic standard. My promo only has the studio album proper on it but if you buy the full release, you will apparently also find two bonus studio tracks and a further two live tracks to round off this wonderful album. If you’re partial to a bit of melodic power metal, then it looks like South America and Brazil in particular is now the hotbed for this type of music and in Scelerata we have another excellent band to shout about.